To close out African American History month, I’d like to explore an aspect of the African American contribution to art that is somewhat sidelined: abstraction. When the term “African American Art” is proposed, many think of the Harlem Renaissance, justifiably so. Most of the artists active during the Harlem Renaissance were more-or-less realists, who were concerned with documenting the African/African American experience. 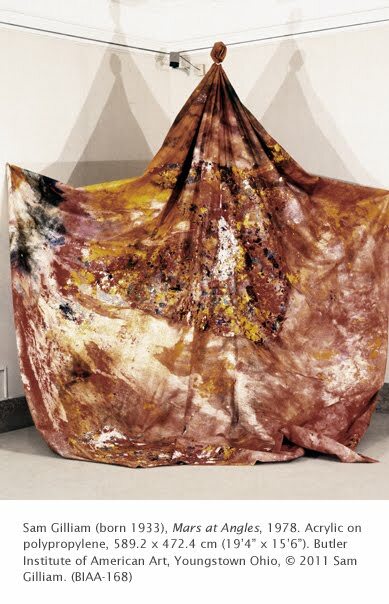 But, it is my contention that there were many who participated in European-influenced modernism that inspired another generation of African American artists, notably Sam Gilliam. The Civil Rights movement of the 1960s galvanized black artists to push for a revival of exhibitions and study of African American art. This revival in the black community led to the formation of a group called Spiral in New York in 1963 meant to promote African American art and aesthetic ideas. The styles of the artists involved – including some who had been active during the Harlem Renaissance – ranged from Abstract Expressionism to Social Realism. The same ideological concerns dominated Spiral as had the artists of the Harlem Renaissance – how to best address and represent the black community. Some felt that their art should reflect recognized symbols and elements of their African ancestry. Others believed that style was a means to and end, and that every black artist’s individual style, regardless of its “blackness,” could represent African American art. Although the Spiral group did not last into the 1970s as a leading force, it caused a resurgence in vitality for the African American artistic community. By the 1970s and 1980s, many black artists were represented in major galleries and museums around the US. A major trend in black art of this nascent period was a variety of styles of modernism. Gilliam has been a major figure in abstract art in the African American community since 1962, when he moved to Washington DC after graduating from the University of Kentucky, Louisville. At the time he moved to DC, abstract expressionist color field painter Morris Louis (1912-1962) was active there and was surrounded by a circle of students. Gilliam became one of them. Louis was inspired by Jackson Pollock’s (1912-1956) innovative techniques in action painting and applied them to color field. He painted energetically on large, unstretched canvases, emphasizing color rather than process, as did Pollock. Gilliam soon adapted the technique of staining large, unstretched pieces of canvas. He folds and twists the canvas as he splatters the paint on it, creating a vital yet elegant surface that is a combination of structure and improvisation. He typically drapes his unstretched canvases, and has even created monumental draped canvases as installation pieces. After abandoning stretcher bars in his work in the 1960s through the 1980s, he has since returned to stretched canvases, often with objects protruding from them.